Girls Wear Blue Too: This mornings harvest! 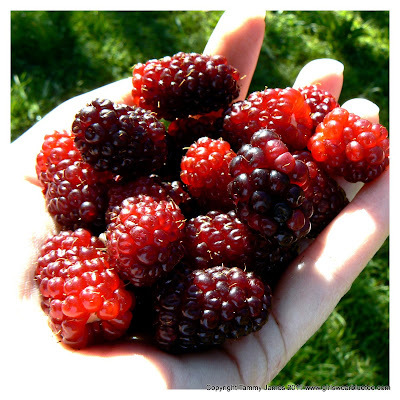 Every morning and Evening and evening I head out to pick Boysenberries. Each day my harvest is bigger. I pick them slightly under ripe and leave them on the bench till they are more evenly black. I then freeze them whole. I'm going to try and make jam when I have enough but there are a few that don't make it to the freezer! For me, the fruit is the best part of Summer ! Yummo. They look so good! The look really good, never tasted them do they taste like mullberries? You are soooo right. Fruit is one of the best things of summer! summer fruit is awesome - we're ploughing through it. raspberries a lovely treat at our house, waiting for the stone fruit to ripen.